‘Opportunistic data to improve sustainable fisheries’. Master student ‘Sven Gastauer’ has joined a field survey with Norway’s most advanced fishing trawler ‘LIBAS’. The trawler has been chartered by the Norwegian Institute for Marine Research in Bergen to study herring, mackerel and blue whiting in the Norwegian Sea. 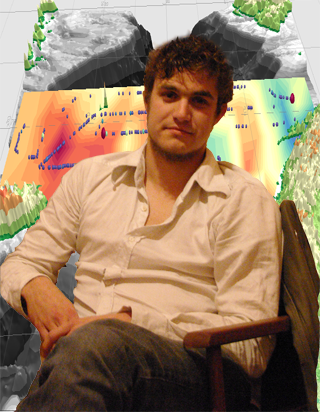 Master student Sven Gastauer, who completed his master thesis at the University of Bangor in cooperation with Sustainovate, Liegruppen AS and the Institute for Marine Research in Bergen, Norway (IMR), was awarded a distinction mark on his thesis and an overall degree, master of sciencewith distinction in Marine Environmental Protection. The thesis was under supervision of Prof. Dr. Michel Kaiser and Sytse Ybema. Sven has left Oslo on July 14th for joining Leif Nottestad and his scientific team onboard LIBAS in Bergen, Norway. His BLOG is a mixture of his impression of daily life onboard this fishing vessel combined with online tools that could enhance data communication. Follow him and the LIBAS crew at http://svengastauer.zoka.cc. He is expected to return to Oslo on the 6th of August. It’s not the first time that Sven Gastauer has reported live from the oceans: he also reported love from the Dutch research vessel TRIDENS! What are the main environmental parameters driving fisheries success and how can these be visualised in a comprehensible, directly usable way? What technological advances are needed to set up an improved data- and communication flow between fishing vessels as well as to onshore facilities? Research area:Norwegian SeaResearch period:June 10-Sept 30. At sea testing: July 15-August 6 onboard LIBASType of fisheries:pelagic (herring, mackerel, blue whiting etc. )Type of data:opportunistic and scientificCompetences: fisheries acoustics, geographical mapping, online communication tools, environmental measurements. Aim of the research The proposed research is part of a Dutch-Norwegian project, the Virtual Marine Platform or ‘VMP’ aiming at constructing a fisheries decision tool based on opportunistic marine data. VMP runs a pilot where the Norwegian fishing company Liegruppen AS has been selected as a data and vessel supplier. The aim of this pilot is to fuse and visualize fisheries data (acoustics and catch) and various environmental variables, directly affecting fisheries success. The availability of such data in a comprehensible way is directly working towards more efficient operational decisions at sea, and hence directly affecting fisheries sustainability. The overall goal of the VMP is to improve fisheries efficiency and reduce environmental impacts (bycatch, IUU, fuel waste) using cross disciplinary marine data sources. The idea is in compliance with some suggestions towards a co-management of fisheries put forward by WWF and EUCC to be included in the revised common fisheries policy to be released later this year. In order to achieve this, sharing of knowledge and improved communication by the different actors is essential. Underlying rationaleThe sea is used by a multitude of players, all constantly collecting data. Mostly this data is solely used to optimize a specific operation, though its potential, especially in combination with cross-disciplinary information is much higher. Fishermen in particular often collect large amounts of data but find it difficult to handle it correctly to improve their operations. In order to improve the common understanding of their environment Sustainovate is exploring experimental data visualisation techniques in multidimensional geospatial maps. Besides this the VMP also acts as a communicator and works towards a better mutual understanding between, as well as within various interest groups. ICES (2007) underlines the potential of opportunistic acoustic data from fisheries vessels for scientific purposes. The project aims to explore the potential of combining and analyzing opportunistically collected Operational data (fuel consumption, time efficiency), Resource related data (Catch information, biological sampling, Acoustic data) and Environmental data with a 4-dimensional visualization. Integrate environmental, acoustic and catch information into a 4-D map using Myriax Eonfusion by Post-processing acoustic data originating from a fisheries vessel during normal operational process, Extracting and using fish quality information from the catch (e.g. Length distribution, Length-Weight relationships, fat content), Gathering environmental data from opportunistic sources and Search for underlying correlations in the combined data based on fishermen’s ideas, environmental factors and temporal and spatial dynamics. Define technological needs for improved data sharing at sea. Which infrastructure do we need and what does already excist? Define which environmental information and data sources would be essential to optimize skippers performance. N.B. All collected fisheries data are owned by Liegruppen and will not be used outside the Virtual Marine Platform project.